WHETHER you want to stand out because a Husaberg is a bit ‘different’ or you just want a fantastic enduro bike, the FE450 offers you both. Husaberg and KTM now share many parts, most notably the engines, but the choice between a ’Berg 450 and a KTM 450 will come down to more than just a colour scheme. There’s no longer the forward slanting engine, which was a beauty by the way, in the ’Berg range but don’t let this put you off. With a KTM engine and chassis the FE450 is obviously one high performance off-roader. PDS shock offers tons of adjustability. 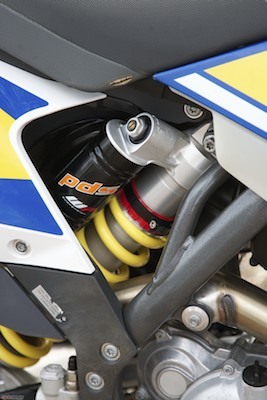 The main body of the chassis is a chromoly design, specifically designed for the PDS shock system that Husaberg has embraced. It’s followed by a high strength plastic injection-moulded sub-frame which is very lightweight and surprisingly strong. The aluminium sub-frame has also undergone changes and is now lighter and targets improved flexibility. The WP 4CS fork and PDS shock are nothing new to the enduro world, but the fork in particular has only recently become available as a production based feature on the Husaberg. It’s a step above what you will find on most other off-road bikes. It’s a patented 4-chamber, closed cartridge design from WP that claims to offer advantages with more constant damping and responsiveness while remaining simple and easy to maintain and service. Newly designed plastics and shrouds top off the look for the new Husaberg and give it a much newer and more modern look. The CNC machined aluminium triple clamps are anodised black for that extra touch of style, along with blue anodised D.I.D rims and CNC machined hubs. The big bore FE450 is quite an easy bike to ride for most types. It’s got strong and plentiful power throughout the rev range but doesn’t hit too hard when you decide to snap it on. 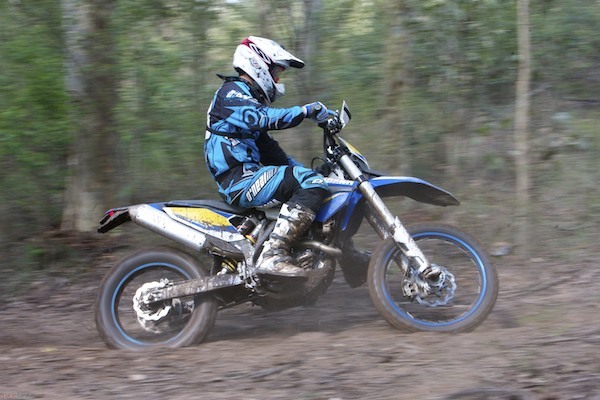 You can easily short shift and grab gears early if that’s your style, but for those of us who like to rev it out a bit harder, the Husaberg has very good top-end power without signing off too early. Potent 450 engine is shared with the KTM 450 EXC-F. The Keihin Engine management system does a fantastic job of ‘jetting’ the bike properly, the Husaberg ran flawlessly at every situation we could throw at it. We drove through water crossings, mud holes, jumped off steep drop-offs and climbed a few snotty hills, but never once did the big 450 even look like having a miss, cough or splatter. If history is anything to go by, the Keihin EMS is also a very reliable system which has bullet proof track record. The WP Suspension is set up quite well and is aimed at a large target audience. Be sure not to let that fool you into thinking that the suspension might not be set up for your liking however, the 4CS fork offers a large range of adjustability and with the correct rider sag at the rear end, there’s a bloody good chance the standard settings will be close to perfect. The PDS shock works great through the trees and often delivers a more predictable and smoother rider than some of its rivals. During our test we only made some minor clicker adjustments to suit the conditions and finished up with a very impressive and comfortable set up. Oversize tapered handlebars headline the cockpit along with the hydraulic clutch and electric boot. The Brembo brakes on the 450 ’Berg are nothing short of fantastic. The massive 270mm front disc pulls up the front end with ease followed by a strong and bitey 240mm wave disc on the rear. The 9.6 litre tank offers a large capacity and will keep us weekend warriors happy with its somewhat long-range capabilities. 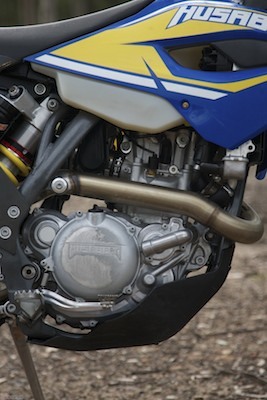 The Husaberg FE450 offers all that could be asked from a modern day off-road machine. It has class leading capabilities in all areas, engine, suspension, brakes, chassis, and even now with its closer integration with KTM you get the sales, service and parts backup that is once again, second to none. If you’re in the market for a big bore 450 and you haven’t taken a good look at the Husaberg FE450 then we suggest you get down to your dealer and check one out in the flesh before these things sell out! 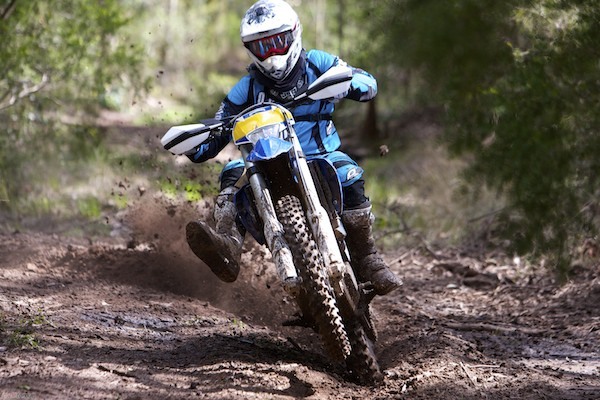 Motorcycling Australia (MA) officially kick starts their annual Come and Try Day on the 22nd and 23rd of February at more than eighty motorcycle tracks across the country.